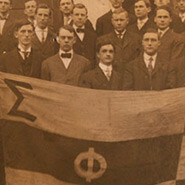 The Oklahoma Beta chapter of Sigma Phi Epsilon is a fraternity who bases itself on the aspects of the Balanced Man Ideal. A balanced man subscribes to the ideals of Virtue, Diligence and Brotherly Love. SigEp at the University of Oklahoma is the largest IFC affiliated fraternity with more than 200 active members. Awarded with the President’s Trophy for outstanding Greek chapter in 2015, SigEp consistently competes for highest cumulative GPA’s among Greek houses and continues to be involved in various leadership positions on campus. Among the top three in intramurals for the last five years, members swept the competition as intramural champions in 2015. Additionally, members placed first in CAC’s University Sing in 2014 and third in 2015. At Sigma Phi Epsilon each man has the opportunity to excel in whatever he desires while growing to become the most balanced man he can be. Learn more about Sigma Phi Epsilon as a national fraternity. To learn more about official rush at the University of Oklahoma, visit the University of Oklahoma Interfraternity Council’s FAQ. The all-Greek GPA is 3.2, compared to an all-campus GPA of 3.0. 66 fraternity/sorority members are presidents/chairs of other organizations. Fraternity/sorority members hold 1,321 executive officer positions on campus. Fraternity/sorority members receive more than 5,500 honors and awards annually. Members perform more than 8500 Individual community service hours and 20,000 group community service hours annually. For the past 2 years, 8 of the 10 PE-ET (Top 10 Senior Honor Society) have been Greek. For the 2009-10 year, 7 of the 9 Big Men on Campus, 6 of the 9 Big Women on Campus, 8 Outstanding Freshmen, 9 Outstanding Sophomores and 10 Outstanding Juniors were Greek. Greek students frequently win nationally competitive scholarships, such as the Rotary Scholarship (Brittany Ryan of Pi Beta Phi) and the Truman Scholarship (Caleb Gayle of Alpha Phi Alpha Inc. and Austin Slaymaker of Sigma Phi Epsilon). Many fraternities/sororities “adopt” international students as honorary members to give them a glimpse of Greek life at OU. Facts provided by University of Oklahoma Interfraternity Council’s official website, which can be found here.